Taking Wittgenstein's "Don't think, but look" as his motto, Richard Strier argues against the application of a priori schemes to Renaissance (and all) texts. He argues for the possibility and desirability of rigorously attentive but "pre-theoretical" reading. 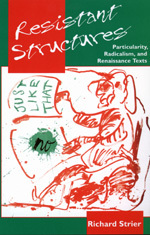 His approach privileges particularity and attempts to respect the "resistant structures" of texts. He opposes theories, critical and historical, that dictate in advance what texts must—or cannot—say or do. The first part of the book, "Against Schemes," demonstrates, in discussions of Rosemond Tuve, Stephen Greenblatt, and Stanley Fish among others, how both historicist and purely theoretical approaches can equally produce distortion of particulars. The second part, "Against Received Ideas," shows how a variety of texts (by Shakespeare, Donne, Herbert, and others) have been seen through the lenses of fixed, mainly conservative ideas in ways that have obscured their actual, surprising, and sometimes surprisingly radical content. Richard Strier is Professor of English at the University of Chicago. He is the author of Love Known: Theology and Experience in George Herbert's Poetry (1983) and the coeditor, with Heather Dubrow, of The Historical Renaissance: New Essays in Tudor and Stuart Literature and Culture (1988).